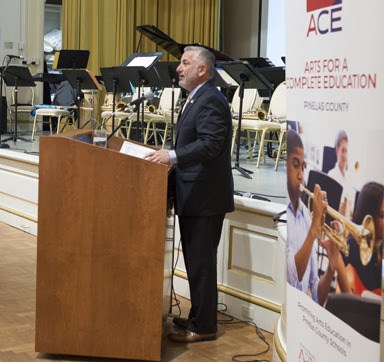 Every year, ACE – Arts for a Complete Education, a program of the St. Petersburg Arts Alliance, hosts a Principals Appreciation Breakfast. 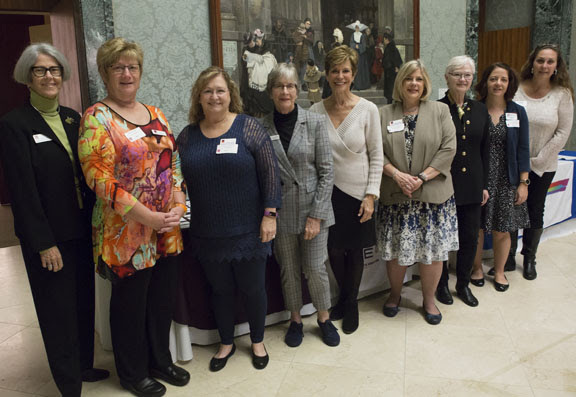 We salute and honor Pinellas County Schools’ principals for their support of arts programs. We have been presenting this event for more than 20 years. We celebrate the student voice and thank principals for ensuring that all students have the opportunity to express themselves in the arts. 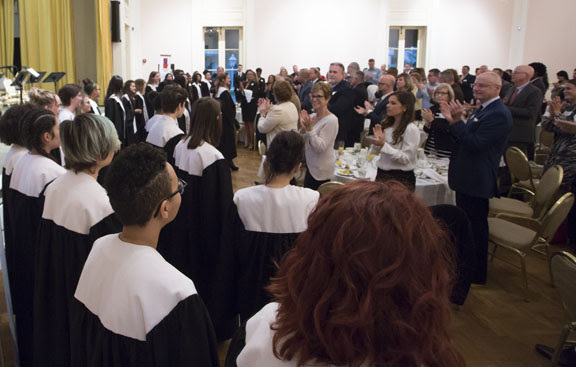 The Principals Breakfast focuses on the importance of arts education for every child. We live in a great community that values arts education and understands the importance of creativity and the educational value of producing quality artistic work. Sponsors for this year’s event include Duke Energy, Steve and Marie Beaty (DEX Imaging), Pinellas Community Foundation, USF St. Petersburg College of Education, Madeline Dunsizer (Fisherman’s Ideal Supply House and the St. Petersburg Arts Alliance. 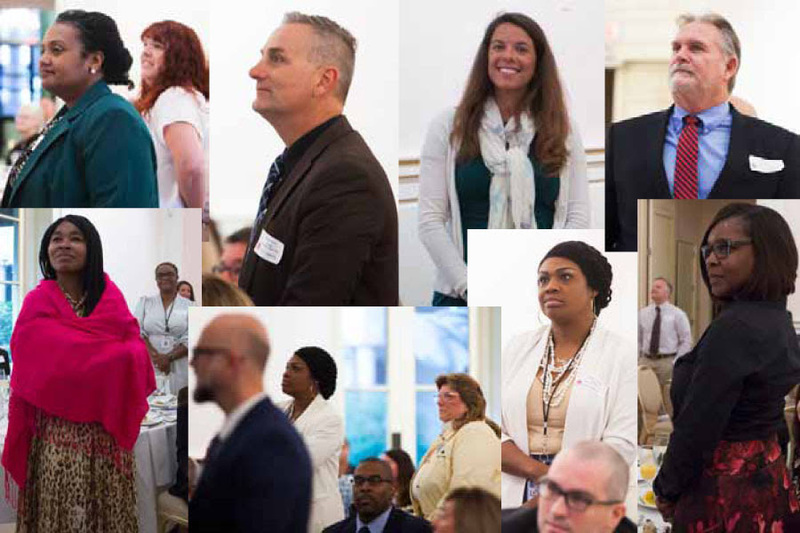 Each year we honor principals in North or South Pinellas County. 2019 focused on South county at the Museum of Fine Arts, St. Petersburg. In addition to the 58 principals of Pinellas County school district’s Areas 3 and 4, a number of elected officials attended including St. Petersburg Mayor Rick Kriseman, Largo Mayor Woody Brown and County Commissioner Kathleen Peters. The school district was well represented with nearly all school board members, Superintendent Dr. Michael Grego, Area Superintendents and others from the district administration. Highlighting the breakfast were student performances. 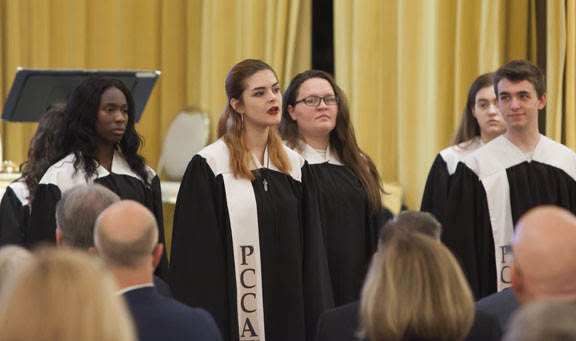 The Women’s Chorale from Pinellas County Center for the Arts (PCCA) at Gibbs High School performed two pieces, including a stunning solo by a young woman with an angelic voice, earning them a standing ovation. This group was recently honored as the Critic’s Choice at the recent Florida Vocal Association, District Music Performance under the direction of Matt Clear. Pinellas County is recognized nationally for its exemplary visual arts program. 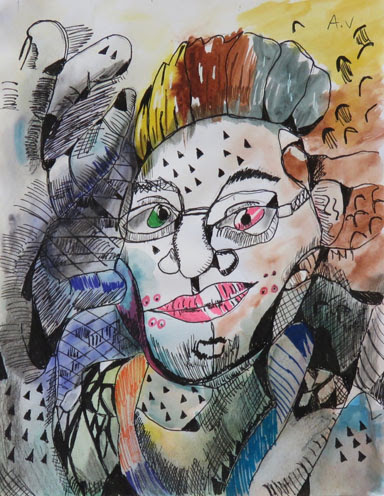 This year our visual arts students received 13 prestigious national Scholastic Art Awards. To give you some perspective, there are over 350,000 entries. For one district to have 13 national awards is astounding. These students will be recognized at Carnegie Hall on June 6. A visual presentation of the winners highlighted several that were honored with their work on printed notecards and this year’s program cover. Students from Dixie Hollins High School Performing Arts inspired the audience with their accounts of their arts education experiences. Dixie Hollins High School has been selected to represent Pinellas County by performing their superior rated One Act Play at the State Thespian Festival. 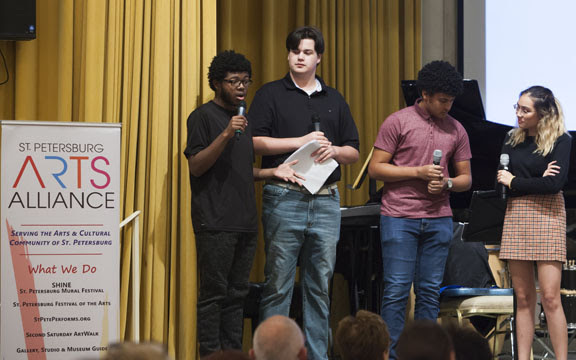 Four students presented pieces from musical theatre showcasing their versatile talents. Many people underestimate the high quality of our public middle schools. Being part of a strong arts program is a great way to keep students engaged and connected to school through the middle school years. These musical ensembles are healthy peer groups that work on high-level cognitive tasks. In an ensemble setting, students must perfect not only their individual voice but work collaboratively and seamlessly to project one musical message. It is not as easy as it looks. The Madeira Beach Swing Rays’ director Ajori Spencer took apart a piece of music, including audience participation with kazoos, so we could see what the brain and body must do when a young musician is making multiple split-second musical decisions. 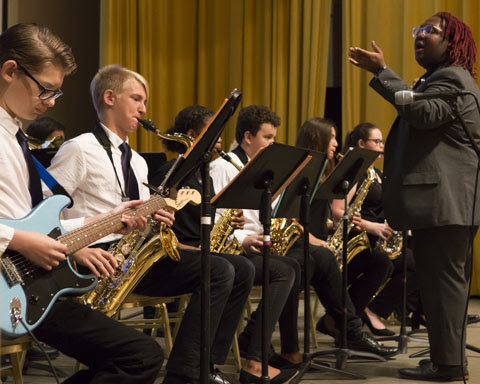 At a recent jazz music performance assessment, after hearing this band, one of the judges was heard to say “that is the best middle school jazz band I have ever heard in my life!” Mr. Spencer showed us how his students earned that accolade. 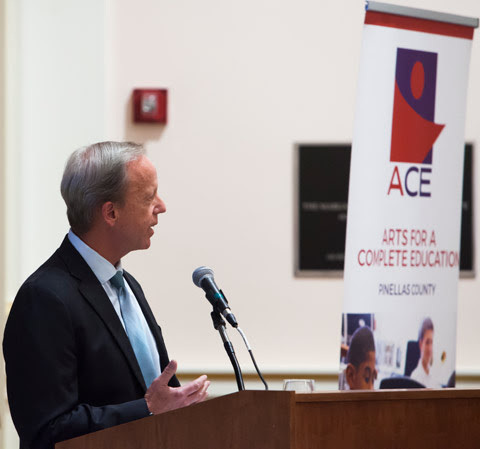 The ACE program is about honoring principals who ensure that arts education remains a vital part of the curriculum. This is no easy task when there are so many other pressures and competing priorities. Principals know arts education is good for students because the arts are academically demanding and vital to students’ social and emotional growth. Arts are intrinsic to who we are as human beings. Arts make us human. Arts have the ability to unite humanity. In arts classrooms, students can find their voices, be heard and valued. 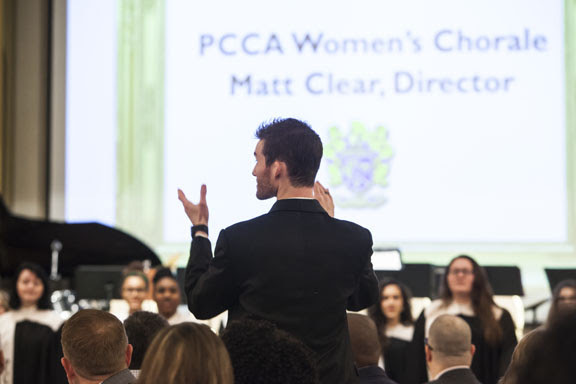 The arts are alive and well in Pinellas County schools due to the leadership of great principals. We thank them for putting students first and providing our students access to quality arts education. This is a credit to every principal who attended. The principals stood proudly, standing for their school and for arts education. We thank our student performers and our principals for their tremendous support of arts education. You ensure that Pinellas County offers quality arts education to ALL students. You can find out more at stpeteartsalliance.org/ace-pinellas.